Credit for determining the structure of DNA has been attributed to James Watson and Francis Crick. But many researchers believe that equal billing should have been assigned to Rosalind Franklin, their collaborator, whose X-ray diffraction images clearly illustrated that the structure of DNA was a double helix. While X-ray crystallography was originally used to determine the size of atoms and the nature of chemical bonds, its applications now include chemistry, mineralogy, metallurgy, and the biomedical sciences. It is a powerful analytical tool used by biologists to determine the structure and function of molecules of biological interest including vitamins, proteins, DNA and RNA, as well as drugs and their rational design. During the course of his 1895 studies on the passage of an electric current through a gas, Wilhelm Röntgen observed that the emitted rays recorded an image on a photographic plate. Because of the unknown nature of these rays, he called them X-rays, a discovery for which he was awarded the first Nobel Prize in Physics in 1901. In 1912, Max von Laue discovered that crystals defracted X-rays. Building upon Laue’s work, from 1912 to 1914, William Lawrence Bragg and his father William Henry Bragg conducted research analyzing crystalline structures using X-ray defraction, for which they were jointly awarded the 1915 Nobel Prize. They found that by measuring the angles and intensities of the diffraction pattern of X-rays through the crystalline sample, a detailed three-dimensional picture of a molecule could be determined. Lawrence Bragg, who at twenty-five was (and is) the youngest Nobel laureate, developed the basic law for determining crystalline structures in 1912: the Bragg law of X-ray refraction, which is still used. Among the foremost biological crystallographers was Dorothy Crowfoot Hodgkin, who determined the structures of cholesterol (1937), penicillin (1946), vitamin B12 (1956) for which she received the 1964 Nobel Prize, and insulin (1939), which she worked on for thirty years. Hodgkin also studied the three-dimensional nature and structure of biomolecules, such as proteins. SEE ALSO: Insulin (1921), Amino Acid Sequence of Insulin (1952), The Double Helix (1953). 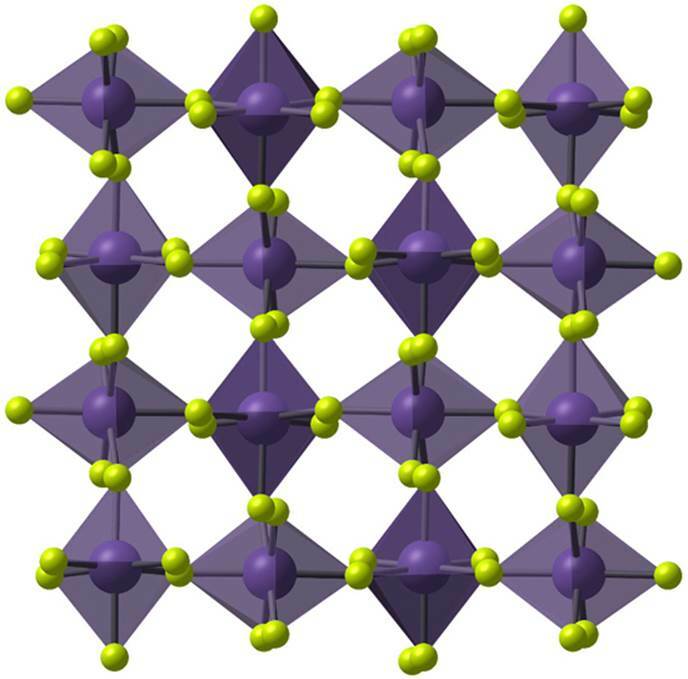 An illustration of the crystalline structure of manganese tetrafluoride (MnF4), as determined by X-ray crystallography.